A Fresh Alternative for Gay & Bisexual Men. 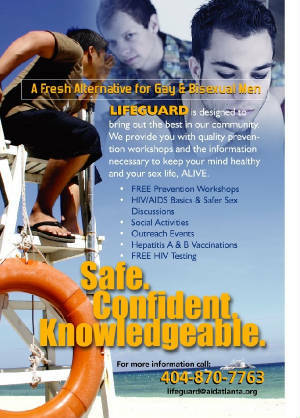 Lifeguard allows men to explore social and intimacy issues based on personal and community views. Participants are encouraged to share and listen in a non-threatening and confidential atmosphere. This interactive workshop promotes individual growth and knowledge of MSM and gay men by facilitating individual opinions, group exercises and role-playing, which mirror real life experiences. For more information on Lifeguard workshops and events, contact the Program Coordinator or call 404-870-7763.